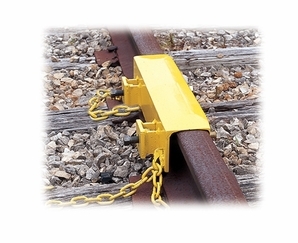 An emergency bridge for broken or badly chipped rail. No need to stop train movement when rail cracks. Fits all rail sizes. Rail splint bolts to web of rail. Assembles with a hand wrench. Safety chains wrap around nearest tie at each end to minimize slippage.